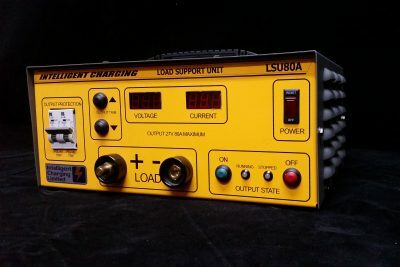 The LSU80A is a general purpose load support unit designed to act as a permanent power supply to maintain backup battery systems whilst alternative sources of power are either impractical or unavailable, such as running diesel engines during maintenance programs or removal of main power systems during maintenance. The LSU80A can support both 12V and 24V systems by simple manual voltage adjustment, with a current capacity of up to 80 amperes. 7 segment displays continuously shows both set voltage and current draw. 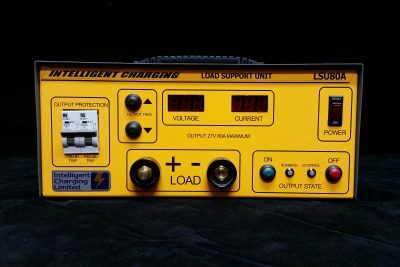 Voltage output can be trimmed in approximately 0.1V steps during operation to offset cable drops and/or variations in demand which create excessive demand on the backup batteries. Output is enabled or disabled by run and stop buttons. Internal variable speed fans are employed to ensure the LSU80A operates at a reasonable temperature. The LSU80A is designed to operate from a standard domestic 13A outlet. The LSU80A has a simple user calibration procedure to ensure the displays show accurate readings. Send us your questions and we will happily respond to you with our knowledge and expertise! 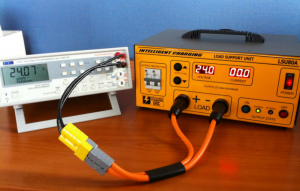 Do you know much about Battery Capacity Testing? Intelligent Charging helps Vulcan Bomber Group! Urgent order just before Christmas Day? No problem for Intelligent Charging!